EasyInstall (also known as IXP) is the perfect Software Distribution and Windows OS Deployment tool, suitable for medium and large companies. EasyInstall is a mature and tested product which has been on the market since 2002 and is in production at several large Danish customers. Take the shortcut with EasyInstall installation concept, EasyInstall makes it not just easier to be system administrator. You will save both time and money, managing computers. EasyInstall can be used for OS Deployment or for upgrading computers from a central administrator console with a few clicks. It saves time every day and provides a lower TCO (Total Cost of Ownership). EasyInstall can install, upgrade, reinstall or uninstall applications. EasyInstall contains a standard software library, used for managing installation packages. EasyInstall has been developed according to Microsoft standards, and are based on the use of standard installation packages. An installation package contains an application, installation files and a script that can perform the installation. Our installation packages can use all the known package technologies, for example MSI, legacy setups and virtual applications. EasyInstall gives you full view over your software licenses and the use of your licenses. Software metering gives a complete overview of the use of costly applications. Before purchasing new software, or in connection with the upgrading of existing, software metering can provide valuable information that can directly translated into saving licensing money. 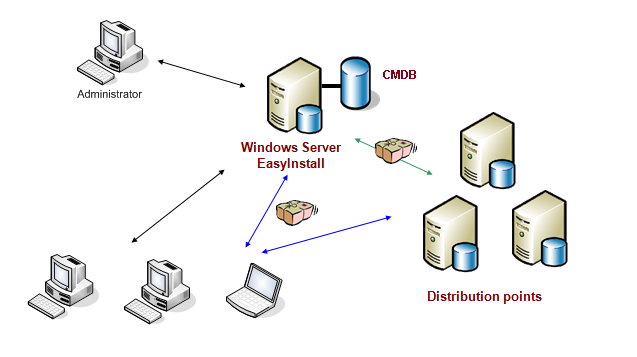 A EasyInstall solution typically use fewer servers and server resources than similar systems. EasyInstall has built-in power management so that all EasyInstall clients can be configured to minimize power consumption and computers can be automatically shut down after work. EasyInstall generating an automatic power management report so you get the full overview of your savings. As a system administrator, you can re-deploy or upgrade a client computer, including all applications. This is controlled by an administrator from a central site. done with a few simple mouse clicks. with a few simple mouse clicks. The user can, at any time re-deploy his own computer (if allowed) by pressing F12 during boot and then select “reinstall”. As a system administrator, you can install an application or reinstall a defect application for one or multiple users. You decide if the installation must be done now or later – e.g. at night using Wake on LAN technology. the package installed free of any user interaction. Instead of troubleshooting an application, just reinstall the application from the EasyInstall administrator console. You get basic inventory information on a computer, like the vendor, model, serial number etc. An updated application package directory. With EasyInstall all applications are always installed in the same way. EasyInstall can power on, power off or restart client computers. You can get information when applications has last been used (package metering). Applications can be installed or uninstalled depending on individual needs. Users can even install applications using the built-in self-service software portal. Android and Apple MDM, all devices are managed from one and the same tool.